Has your current site been getting you down? Did you lose your previous web developer? Is your site broken and needing repair? If your current site is more than a few years old, it’s probably time for a site overhaul. Out-of-date information can lead to lost business. Don’t let your site embarrass you. MuseArts can help give your site a fresh look, make repairs, add new features, update information, and provide you with a content-management system that makes it easy for you to make changes any time you want. We can bring a new perspective and improve an older site, with a redesign that will allow it to work well with newer computers and browsers and continue to meet your customers’ expectations. MuseArts can help you regain control of your web site if your previous web developer has moved on or stopped answering calls. We can help you get back on track. 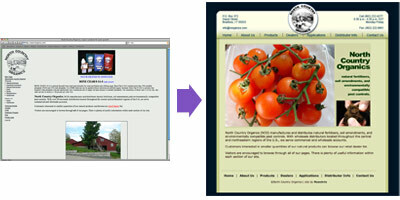 A redesigned site can be a better web site, if you bring to it everything you learned from running your old web site. At this point, you have feedback from your existing operation, know what works and what doesn’t, and have a better sense of how you would like to use your site. Call MuseArts to make it happen. Take a look at our Portfolio for examples of recent work.